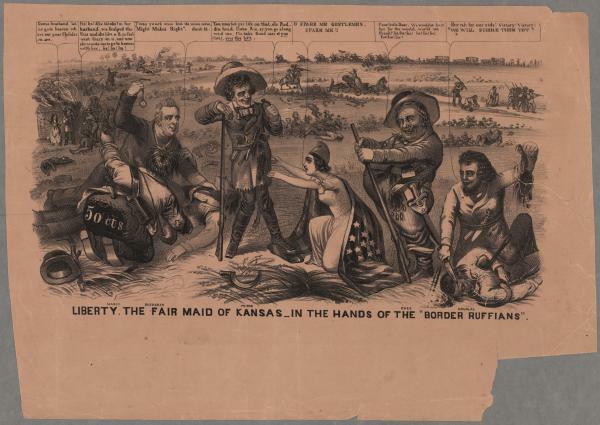 Liberty, the fair maid of Kansas - in the hands of "Border Ruffians"
This very rich political cartoon criticizes the Democratic Party during the 1856 Presidential campaign. The Democratic ticket, headed by James Buchanan as Presidential candidate, supported the Kansas-Nebraska Act, popular sovereignty, states' rights, and limited government. The image predicts death and destruction from an outbreak of civil war in Kansas because of the Kansas-Nebraska Act and a Democratic victory. In the background, there is total chaos - faceless figures murder as others try to escape in wagons, and livestock run amuck. On the left side of the image, in front of a burning dwelling, a woman says to a man, "Come, husband, let us to go heaven where our poor Children are." The man laughs to his peers, "She thinks I'm her husband, we Scalped the Cus and she like a D_mn fool went Crazy on it." In the foreground, Liberty, the central female representing the United States and draped in an American flag, begs President Franklin Pierce, "Spare me!" To the left of Pierce and Liberty, James Buchanan and Pierce's secretary of state, William Marcy, pick the pockets of a deceased victim of the chaos around them. To the right of Pierce and Liberty, Democratic Party leader Stephen A. Douglas scalps a farmer and exclaims, "We will subdue them yet!" Beside Douglas, Lewis Cass licks his lips and laughs, "We would'nt hurt her for the world, would we Frank?" Pierce, Cass, and Douglas all appear heavily armed, and Pierce stands on the corner of the flag that is around Liberty. Maier, et al. Inventing America: A History of the United States, vol. 1. New York: W. W. Norton and Company, 2003, pages 480, 486. [Woman in background]: Come husband let us go to heaven where our poor Children are. [Man in background]: Ho! ho! She thinks I’m her husband, we Scalped the Cus and she like a D_mn fool went Crazy on it, and now she wants me to go to heaven with her, ha! ha! ha! [James] Buchanan: Twas your’s once but its mine now. “Might Makes Right,” dont it. [Franklin] Pierce: You may bet yer life on that, ole Puddin head. Come, Sis_sy, you go along wid me, I’ll take Good care of you (hic), over the left. Liberty: O SPARE ME GENTLEMEN, SPARE ME!! [Lewis] Cass: Poor little Dear. We would’nt hurt her for the world, would we Frank? ha! ha! ha! he! he! he! ho! ho! ho! Exact Title: Liberty, the fair maid of Kansas _ in the hands of the "Border Ruffians"
Dimensions: 37.0 x 21.2 cm., and 32.8 x 19.0 cm.